Recently I experimented a bit with Eclipse packaging. At first it seems not very important, given that the folks at Eclipse work hard to produce executable packages. On the other hand, the Mac OSX packaging is not the best possible one. In this structure Eclipse.app is a special folder, that acts as an executable item for OSX. This structure is easy to produce, very similar to the ones of Windows or Linux, but there are some drawbacks. First, in the /Applications folder the folder icon is a generic folder, instead of an Eclipse icon (okay, this one is easy to resolve, as every folder can have a custom icon). More importantly, all indexer try identifies the executables by name. 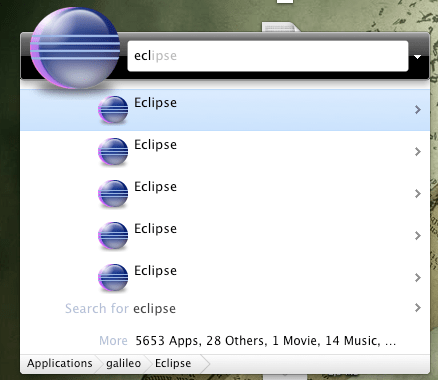 If there are multiple Eclipse instances installed, then every instance will have the same name displayed. If the path is also displayed, it is possible to distinguish between the instances. Some time ago (~1 year) I tried simply renaming the Application bundle did not work, as there is seems to be some kind of configuration that won’t work after that. But this was quite a time ago. Now I found another possible solution: there is an Eclipse repackager script shared in GitHub I could give a try. A quick testing showed it does not handle dropins, so I hacked and shared a new version (and meanwhile I was able to test Git for the first time – btw. thanks for the fine tutorials, GitHub team 🙂 ). To tell the truth, even the updated script has some serious issues: I could break the app two ways: the smallest issue was, that P2 could not install or remove anything, or in the worse case the bundle couldn’t even start. So I have a quick question: does anyone has a working solution for creating proper, working app bundles for OSX from Eclipse? Or simply could help fixing the repackager script?